The following drill is part of Soccer Awareness New eBook: Tactical Thoughts on the Development of the New 4 v 4, 7 v 7 and 9 v 9 Game Sizes. Taking simple tactical ideas created on the training field to the game situation. We teach certain movements in training; players take ownership of them in the game situation. The following presentation is designed to simplify the potential Patterns of Play of players at 7 v 7. We show 3 different systems of play. Eventually we will show several movements but we need to build up to these slowly and with patience. Patterns of Play are designed to be practiced to help players identify common situations in the game itself. When these situations occur the players involved will think about the movements within a pattern of play (that they practiced in training) and will re-enact them in the game. Our goal is to make this an unconscious decision where the players don’t even have to think about it; they just do it naturally / instinctively. This is the attacking team shape now a 1-2-2-1. The attacking team shape we change to when we are chasing a game; perhaps losing 1-0 and wanting to be more positive in attack. So this now would be the start position. This is the attacking team shape now a 2-3-1. The attacking team shape We push one wingback / FB forward only and keep safe at the back should the opponents win the ball and counter attack. The previous diagrams show simple and distinctive patterns of play for the team to follow; from a basic defending shape; to a basic attacking shape. The Third diagram shows a more advanced pattern of play for the attacking phase. This is the attacking team shape now a 2-3-1. The attacking team shape We push one wingback / FB forward (3) on only and keep safe at the back should the opponents win the ball and counter attack. 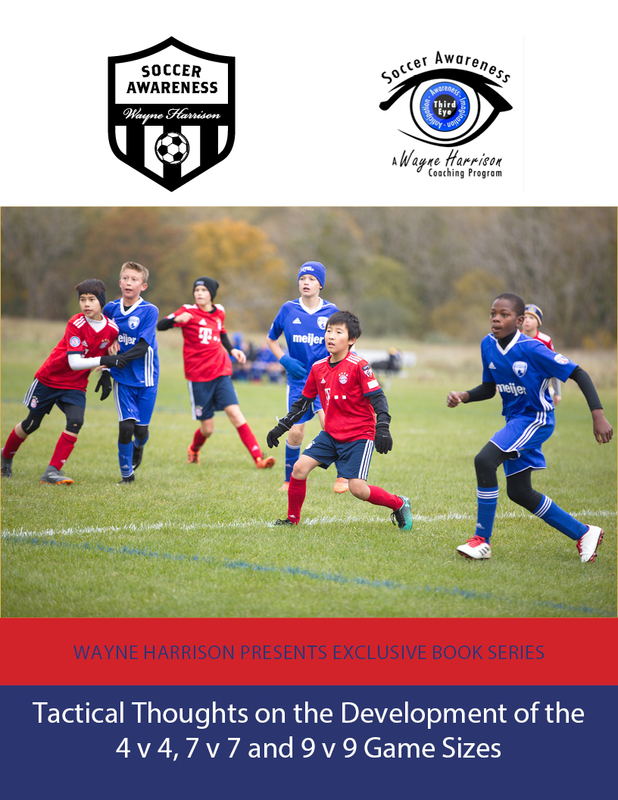 Get more like this including Small Sided 4 v 4 Attacking Games, Patterns of Play at 7 v 7, Team Shape Development in 9 v 9 and lots more in Soccer Awareness eBook: Tactical Thoughts on the Development of the New 4 v 4, 7 v 7 and 9 v 9 Game Sizes.